What keeps us coming back again and again to The Believer Magazine is our faith in the sharp intellect and discerning taste of its editors. 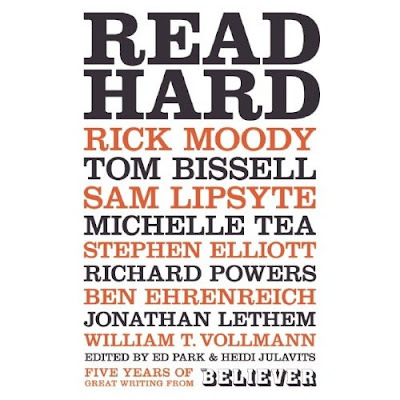 Their latest publication, READ HARD, is a perfectly sized anthology of The Believer's best essays and creative non-fiction that more than lives up to our expectations. READ HARD's editor, novelist Heidi Julavits (renown known for her essay interrogating the current nature of book reviewing) collects diverse pieces that vary from grim (William T. Vollmann's essay discusses WWII air strikes from a German point of view) to funny (Tom Bissell reviews the import and validity of 'How To' books for writers) to in depth discussions of Paul Anka or book tours with Michel Houellebecq. One thing they all have in common is a captivating style that pushes their unusual subject matter to the forefront of our minds. Come in to check out Read Hard and the rest of our McSweeney's collection!